This is the best view on any of my frequent rides. 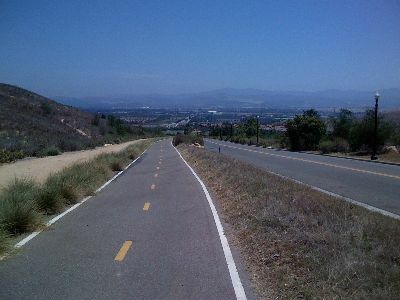 Mostly because it’s a view of a nice long downhill stretch after a pretty good climb. It’s not very obvious in the picture, but there’s a giant orange balloon over on the right side. It’s at the future Irvine Great Park, the first thing they’ve put in there. It only just opened. You can go for a ride to get an even better view of Irvine.